A strange mix of Soviet T-72 and Chinese Type-85 with local technologies and modifications the Pokpung-Ho (Storm Tiger) is now operated by the 105th Seoul Ry-Kyong-Su Guards Division, the elite armored division of the North Korean Army today. It was carefully observed in parades and through official broadcasts, enough to distinguish at least four marks, and its main characteristics with a certain degree of likeliness, if not accuracy. Official North Korean Army designations are Chonma-215 (the 115 mm gun armed version) and Chonma-216 (125 mm). Added to that observations were made of a third MBT, either derivative or intermediate, the Songun-Ho, sometimes amalgamated with the Pokpung-Ho I/II. Just after 1990 and the dissolution of the Soviet Union, immense stockpiles of non-modernized T-72s were to be scrapped and were sometimes resold. 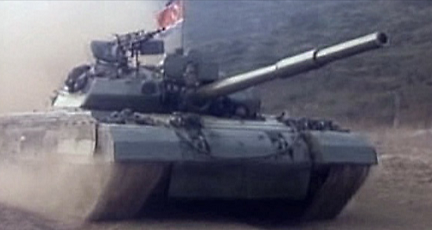 North Korea apparently benefited such a deal and procured itself T-72s that were reverse-engineered. It is generally accepted that the first version of the Pokpung-Ho, was studied in 1992 by the Second Machine Industry Bureau and produced by the Ryu Kyong-su Tank Factory (Sinhung, South Hamgyong Province). Although apparently similar to the Chinese Type 85 and T-72 it was still armed by a 115 mm 2A20 gun from the T-62 series. However it was only publicly observed at the the spring 2010 parade but was first observed by experts in 2002. It is therefore sometimes classified as the M-2002 by the West. 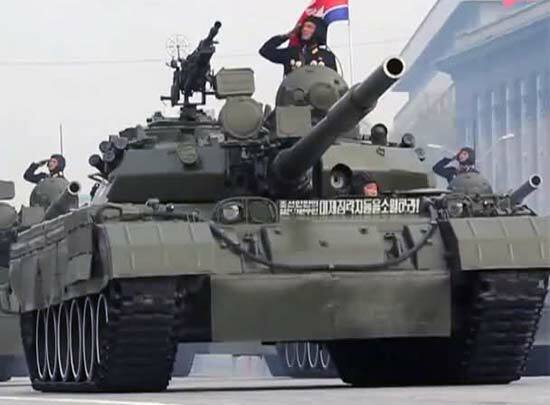 In between, North Korea showed interest for the Russian T-90 and it is safe to think that its design has some influence over later version of the tank. Until today, the figure generally accepted for production is comprised between 200 and 250. In all directions it shows strong improvements over the Ch’onma-ho. In size, hull shape, silhouette, the P’okp’ung-ho has all the trademarks of a T-62 chassis modified to close on the T-72, light, low, with a well-sloped frontal armour and classic compartimentation of the type. There is an additional pair of road wheels, a long hull and a turret and sides showing additional appliqué armour of light laminar steel. The turret in particular shows distinctive wedge-shaped armor modules that can be certainly upgraded, containing Composite Armour modelled after the early T-72M. The early model (and serie IV) still shows the old cast hemispheric turret with a rear ammo storage turret basket and front appliqué armour with ERA blocks also introduced on the Serie III. Other than that, no modern system of active protection similar to the modernized T-72 or T-90 was observed but the traditional infrared searchlight. There is no way to prove the existence of a laser warning detection system, but the presence of an NBC system is highly probable, and two pair of smoke projectors are mounted on the turret’s sides for active concealment, plus probably the usual Soviet-style exhaust injection smoke generator. On the armament side, observers noticed that the first Mark seemed equipped with 2A20 115mm gun, while the others were given the larger 2A26/2A46 125mm smoothbore gun, firing a domestic AP round. The secondary armament is the usual KPV anti-aircraft machine gun, and the coaxial light machine-gun. I addition the serie II shows in parade pintle-mounted SA-7 MANPADS (there is no clue as if these are used in operations but only on parade), while the Serie IV shows a twin mounted AT-5 Spandrel launchers and rear SA-16 MANPADS. The on-board eletronic systems are probably the most advanced, with a computerized Fire Control System given the presence of sensors and meteorological mast, ensuring a high first hit-capability and good accuracy on long range and poor visibility. It is perhaps modelled after the Chieftain FCS, passed through Iran. There is speculation also about a local adaptation of the PNK-3 or PNK-4 day sights and 1K13-49 periscope active/passive sight. It is also speculated that the night sight is still derived from the old T-62 model. Infrared sensors are also visible, possibly of the TPN-3-49 or TPN-4 type. Crucially also, turret arrangement suggest the presence of a loader. The propulsion side is probably the most foggy feature, and estimation rates place the total output of the powerplant as high as 1,500 hp, although the usual figure retained by most experts is likely to be around 1000-1200 hp. It’s much probably also a 12 cylinder diesel. The drivetrain reminds the T-72, with torsion bars units. Pokpung Ho I: First shown publicly in the summer of 2010, probably fitted with T-62’s 2A20 115mm smoothbore and applique+ spaced armor. Pokpung Ho II: 125 mm smoothbore and new turret with composite armour +ERA front glacis, observed in October 2010. Pokpung Ho IV: Received 2 AT-5 Spandrel launchers fitted above the main armament and 1 SA-16 MANPADS fitted on the turret rear. Like most North Korean AFVs and especially MBTs (matter of national pride) obtaining straight facts from available sources in the West, moreover from South Korean sources is a tricky endeavour at best. It is known that these tanks forms the entire 105th Seoul Ry-Kyong-Su Guards Division, North Korean elite unit. 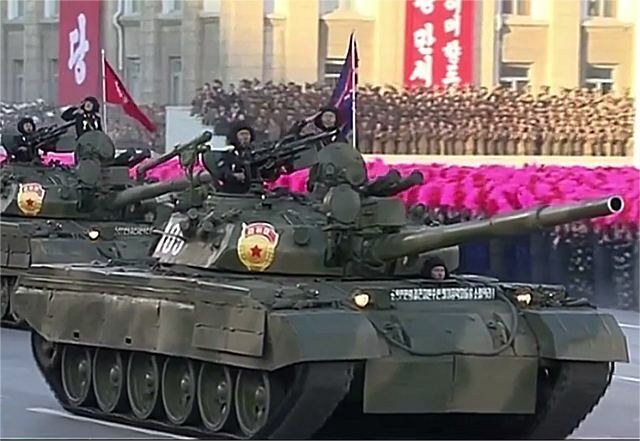 This would suggest a rather limited number of tank if that was not for the diversity observed in the Pyongyang parades. Nevertheless, with the poor performances showed by the T-72 in the gulf war, added to the threat posed by the upgraded South Korean K1A1 and K2 Blank Panther it’s quite obvious that many armoured units are swapping their T-54/55s and T-62s, or even Chonma-Ho for the last MBT in the inventory. Indeed a Chosun Ibo report dated 17 June 2002 affirmed that the new MBT had performances equal to the Russian T-90. In fact, Kim Jong-il visited the Omsk Transmash defense plant in 2001, so we can assume the main goal of the North Korean engineers working on this project. Apparently only the actual economic struggles of the country, plus probably the lack of access to several sensitive core technologies that prevent this new MBT to be mass-produced. This very foggy MBT is only known from parades and rare footage. It is generally assumed as a development of the Pokpung-Ho by the Second Machine Industry Bureau, but (author’s opinion) it could have been also a cheaper intermediate between the T-62 and the more advanced (and costly) Pokpung-Ho, reverting to a cast turret. Turret hatch arrangement are similar to the T-62 (crew of 4), but compared to the chassis it looks taller than on the T-62 and pictures taken in parade shows a wind sensor behind the tank commander’s position, a radio mast, four smoke mortars on each side and a pintle for a MANPAD. A lot of speculations has run about the topic since 2010. According to http://english.yonhapnews.co.kr/ “The Songun is believed to have been named after the military-first policy heralded by former North Korean leader Kim Jong-il as a guideline for ruling the impoverished, communist country.”. And according to the same source, Yonhap News Agency “In 2013 news surfaced that North Korea fielded 900 new MBTs” most of which are assumed to be of the Chonma-Ho V and Songun-Ho types. We will certainly treat this tank as a standalone if we peak into more serious informations. Armament 125mm sb, 14.5mm KPVT, 7.62mm KPT coax. Possible rendition of the Songun-Ho (II) as of 2010 in olive green as shown in parade. This post should be updated regarding the new version with an apparent dual AA machinegun mount on the turret, seen on the Day of The Sun parade. The opening paragraph does explain that the Official designation of the vehicle is Chonma-Ho 215/216, however because Pokpung-ho is the more commonly used name in English it was decided to retain it as the title of the article. This information you have seen with your eyes at the parade. You can clearly see that MANPADS are on the pole turret that potrudes out the cupola and electronics with camera/sensor above it. Actually it might be AGS-30 not 17. Hah. The grenade launchrr on Pokpung-ho has AGS-30 styld barrel, looks like one yet also has feature of AGS-40 at how it portrudes the receivet section more than 30. Almost if its AGS40 Balkan.